How is it that Earth developed an atmosphere that made the development of life possible? A study published in the journal Nature Geoscience links the origins of Earth’s nitrogen-rich atmosphere to the same tectonic forces that drive mountain-building and volcanism on our planet. It goes some way to explaining why, compared to our nearest neighbours, Venus and Mars, Earth’s air is richer in nitrogen. The chemistry of the air we breathe is, at least partly, the result of billions of years of photosynthesis. Plant life has transformed our world from one cloaked in a carbon dioxide-rich atmosphere – as seen on Mars or Venus – to one with significant oxygen. About a fifth of the air is made up of oxygen, and almost all the rest is nitrogen. But the origins of the relatively high nitrogen content of Earth’s air have been something of a mystery. Geoscientists Sami Mikhail and Dimitri Sverjensky of the Carnegie Institution of Washington have calculated what nitrogen is expected to do when it is cycled through the rocks of the deep Earth by the churning cycle of plate tectonics. Active volcanoes not only shower volcanic rock and superheated ash as they erupt molten rock into the air, they also vent huge amounts of gas from Earth’s depths. 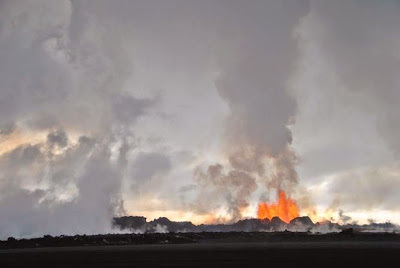 The latest eruptions in Iceland, for example, have been noted for the amounts of sulphurous fumes that they have emitted. Alongside sulphur, steam and carbon dioxide, volcanoes next to active tectonic plate boundaries pump massive quantities of nitrogen into the air. Mikhail and Sverjensky explain this through the chemistry of what goes on beneath those volcanic roots. As oceanic crust is subducted (that is, dragged down beneath continental crust) down into the depths of the Earth by the cycle of plate tectonics, it releases “volatile” elements into the rock above. These volatile elements contain nitrogen – and its fate could be to either end up locked in minerals or be released as gas into the atmosphere. The chemical composition of the overlying rocks decide the fate of the volatiles. Nitrogen deep in the Earth’s crust will tend to form ammonium ions (NH4+) which get incorporated into solid silicate minerals easily. Silicate minerals are among the most abundant kind of minerals in Earth’s crust. This is presumed to occur to much of the nitrogen on Earth and pretty much all of the nitrogen on Venus and Mars. But when those silicate minerals react under certain conditions, such as in the presence of oxygen or oxygen-containing compounds, the ammonium molecules break down to a mixture of water (H2O) and nitrogen (N2). The latter then finds its way to the surface and the atmosphere through volcanic vents. Mars and Venus have no plate tectonics and relatively little nitrogen. The nitrogen-rich atmosphere that made Earth a home for life thousands of millions of years ago appears to have its origin in the fact that the planet itself is a geologically active beast. Subduction, a driving force for plate tectonics, also creates the chemical reactor to make deep nitrogen. The same forces that drive the formation of mountains and continents, oceans and islands, are also responsible for our atmosphere and biosphere. The findings suggest that nitrogen first started building in the atmosphere more than three billion years or so ago, and implies that plate tectonics was already active on Earth at that time. This fits in with other estimates for how long Earth has been an active planet, and it contrast starkly with the geologically stagnant picture we have of Mars and Venus. The results provide new insights into the pre-conditions guiding the likely character of life-hosting planets around distant stars, elsewhere in the universe.